The only kind, an attractive perennial, popular on account of its sweet-smelling foliage, which, however, is not fragrant until the leaves are dried. 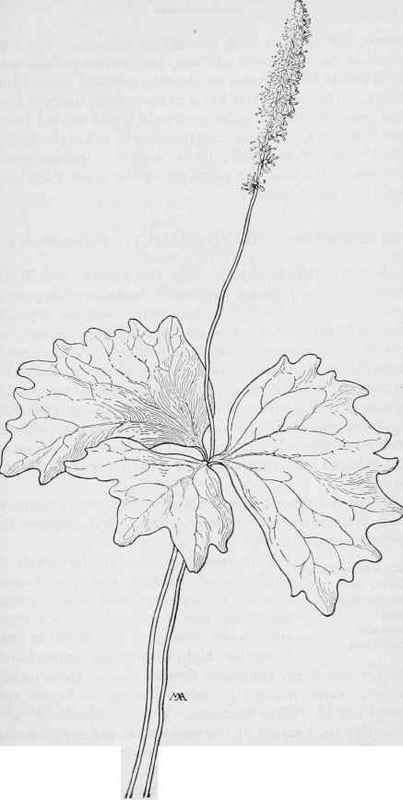 It has a very-slender rootstock and only one large leaf, with a very long, slender leaf-stalk and three, oddly-shaped leaflets, from two to six inches across, bright-green, smooth and thin in texture, but not glossy. The single, very slender flower-stalk, from one to two feet tall, bears a crowded spike of many, tiny, scentless, white flowers, without either calyx or corolla, but consisting of a cluster of stamens, with long, threadlike filaments, the outer ones broader, and a pistil with a broad stigma and no style. The effect of the cluster is feathery and pretty and the broad leaf is very conspicuous, on account of its size and shape. The crescent-shaped fruit contains one seed, is at first fleshy, but becomes dry and leathery. This grows in the woods in the Coast Ranges, from near sea-lev el up to seven thousand feet. It is also called Vanilla Leaf and Deer-foot. Sweet-after- Death- Achlys triphylla. STRAWBERRY SHRUB FAM. Calycanthaceae.